What is Neverwinter Nights 2 ( NWN2 )? 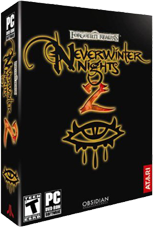 Neverwinter Nights 2 (NWN2) is both a single player and a multiplayer Dungeons & Dragons role-playing game (RPG). It is by far the closest thing there is to a true D&D game on the computer. As a player, you are able to choose what skills and abilities you will develop as you voyage though the complex and dangerous fantasy world of Forgotten Realms. Be a deadly and dangerous rogue moving through the shadows using stealth and secrecy, be a scholarly wizard and wield powerful magic against your enemies, be a hulking barbarian whose lust for battle is matched only by his terrible rage, be an armor-clad paladin who protects the innocent and vanquishes his foes, be a crusading cleric who heals the sick and defends the helpless. Neverwinter Nights 2 allows you to create your own worlds. This revolutionary game comes with all the tools needed to construct your own unique lands of adventure. The Neverwinter Nights 2 Toolset allows even novice users to construct everything from a quiet, misty forest, to a dripping cavern of foul evil, to a king's court. All the monsters, items, set pieces and settings are there for world builders to use. But do not stop there; construct traps, encounters, custom monsters, and magic items to make your adventure unique. It is very easy to get your own pre-patched copy of Neverwinter Nights 2. You can pick up a direct download copy of Neverwinter Nights 2 Complete at gog.com for $19.99! With almost any type of internet connection, Neverwinter Nights 2 can be played online at the Realms of Trinity, all sharing in the adventure of one of our three campaigns. You can organize and participate in one of our many Role Play event series with your friends as they journey on their quest. The Realms of Trinity, is an online gameworld (also called a persistent worlds, or PW) for you to explore, created by professional and talented game builders. You can connect to the Realms of Trinity by simply starting the game and clicking Multiplayer. Click Direct Connect and enter server.realmsoftrinity.com in the address box and click connect. That's it! To enhance your gaming experience playing Neverwinter Nights 2, it is highly recommended that you check out the details and install the client extender. It greatly reduces game crashes and playing experience. To find out more, check out the Download and Details Here. For information about Neverwinter Nights, check out the neverwinternights.info site!